Like many people, I picked up Lament after reading Maggie Stiefvater's incredible book Shiver. Lament is not Shiver, but it is excellent in its own right. My favorite part about Shiver was Maggie's writing; it was so stark, fresh, and beautiful. Her sentences felt like winter - ice cold air, untouched snow, icicle-laden trees. The writing in Lament is very different but still wonderful. The prose is lush - bright green, springtime, clover fields. The settings of both books exactly correspond to the feeling I got from Maggie's writing. I'd like to know whether it was intentional. Lament was my first faery book. It is heavily influenced by Celtic mythology and folktales. Deidre Monaghan is an incredibly talented harpist and singer. She seems to specialize in Celtic music. At a music competition, she meets a flautist named Luke Dillon, a boy she'd seen in a very strange dream, and feels an unexplainable attraction to him. On a whim, they enter the competition with a duet; together their music is simply otherworldly. They bond between them becomes incredibly strong, incredibly fast. Deidre soon discovers that she is a Cloverhand, a human able to see faeries. She is also telepathic and telekinetic. Luke has secrets of his own - he is a gallowglass, a 1000-year old assassin for the Faerie Queen. Deidre was to be his next target, but he falls in love. Apart from Luke, Deidre has a decent support system. The Cloverhand trait runs in families. Granna has much to teach Deidre. She also has a steadfast best friend, James, who is never without a joke. Her life is made more difficult though, by her overbearing mother and hostile aunt Delia. Deidre relies on James, Granna, and Luke to help her through this new world of faeries. 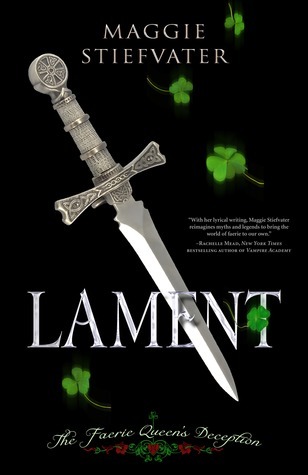 Lament only gets four stars from me despite enjoying the book a great deal. I did have some problems with it. I think most of the problems are common first novel issues. For example, Deidre's best friend was flat. He was funny all the time - everything was a joke. Even when he showed a little more depth and ability, it was still all a joke. I wish we saw more of him. Also, Deidre's father popped in and out of the story. For the first half I didn't even realize Dad was in the picture. Everything revolves around her mother. Then suddenly she starts referring to both "mom and dad." But Dad is still just kind of there. The plot would have flowed better if he'd just been gone altogether. I didn't always like Deidre. Her lightening-fast, icy temper was just weird - normal people do not fly off the wall that often and that quickly for such minor things. She also used the word "friggin" way too much. I almost would have preferred her to just use the actual "F" word despite my general dislike of swearing. There is some swearing in this book. It was unnecessary, but with the exception of "friggin" it didn't really bother me. I also don't like the way she treats James. As soon as she meets Luke, James pales in significance. Even his fairly obvious pining doesn't garner her attention or sympathy. Despite my misgivings about Deidre and some of her choices, she is a caring, kind, and courageous girl. She redeems herself as the book goes on. Same thoughts as in my review! Loved the description! You should read the iron king! I'm your 70th follower! I have Lament and am looking forward to reading it. I'm glad you liked it, hopefully I will too! I read this one too, finally. I had the same problems with it that you did, but still enjoyed it!